1. Set temperature to the extreme hot (25°C~32°C) position. 2. Set the fan speed to the or position. 4. The air conditioning will be turned on according to the detected ambient temperature and outside (fresh) air position will be selected. 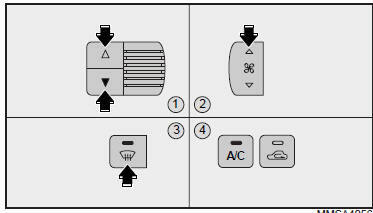 If you don’t want the air conditioning or outside (fresh) air position press the corresponding button to cancel the operation. Clear all snow and ice from the hood and the air inlet in the cowl grille to improve heater and defroster efficiency and to reduce the probability of fogging on the inside of the windshield. Do not use defrost position during cooling operation in extremely humid weather. The difference between the temperature of the outside air and that of the windshield could cause the outer surface of the windshield to fog up, causing loss of visibility. In this case, set the mode selection knob to the position and fan speed control knob to the lower speed. 1. 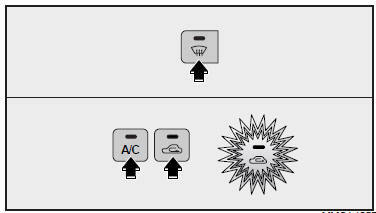 Select the defrost position pressing defrost button ( ). 2. While holding the air conditioning button A/C depressed, depress the recirculated air position button ( )at least 5 times within 3 seconds. The indicator light in the recirculated air position button ( ) will blink 3 times with 0.5 second interval. If you want to return to the automatic air conditioning system and outside (fresh) air position, repeat the same procedure. Follow the same procedure if you want to cancel or return to the forced outside (fresh) air position when you start the engine with recirculated air position selected manually before the engine off.